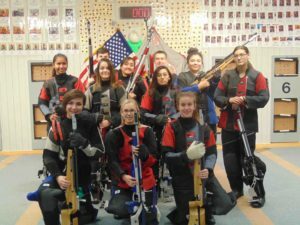 VILSECK, Germany — Shooting their highest score of the season, Vilseck Army Junior Reserve Officer Training Corps, or AJROTC, defeated Lafayette AJROTC 1458 to 1425 last week in the National Air Rifle League. Their third win in a row, Vilseck AJROTC is in second place in their division with a 3–0 record. Vilseck AJROTC was led by Shelby Hartmann who shot a 374. The remaining contributing members were Alyssa Garcia, Mikaela Motherwell and Victoria Banister. Vilseck AJROTC is from Vilseck, Germany, and is coached by Mitchell Pollock. Lafayette AJROTC dropped to 1-2 in the season. They are currently fifth place in their division. Shooting their highest team score of the season, Lafayette AJROTC was led by Emma Sargeant who shot a 378. The remaining contributing members were Alyssa Kiser, Emiley Jenkins, and Ella Carter. Lafayette AJROTC is from Lafayette, Georgia, and is coached by Perry Fouts and 1st Sgt. David Tomlinson. Vilseck AJROTC will compete against Kaiserslautern Air Force Junior Reserve Officers Training Corps, or AFJROTC, from Kaiserslautern, Germany. Kaiserslautern AFJROTC currently has a 0–2 record. Lafayette AJROTC will compete against Granbury Marine Corps Junior Reserve Officers Training Corps, or MCJROTC, from Granbury, Texas. Granbury MCJROTC currently has a 2–1 record. Vilseck and Lafayette AJROTC are competing in the JROTC Precision Champions Division of the Orion National Air Rifle League. Sponsored by the Orion Scoring System, the league is a national team league for high school teams and junior rifle clubs. The Champions Division is the most difficult division in the league. The league has two parts: an 8-week round-robin regular season going on now, followed by a single-elimination tournament for the top eight teams who will compete for the league championship. In each game, the teams compete in what is known as a Standing Air Rifle match. The match is almost identical to the air rifle events in the Olympic Games. Each athlete shoots 40 shots in the standing position, the most difficult position in rifle competitions. Each shot is worth a maximum of 10 points. The sum of points scored in the 40 shots is the athlete’s total. The team score is comprised of the best four athletes from each team. For more information on the league, including complete standings, visit www.orionscoringsystem.com/AirRifleLeague.